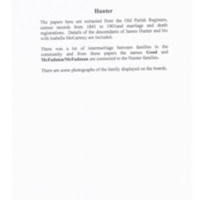 Details of the nine children of James Weir and Ann Menzies including intermarriage with the Paterson family can be found here. Three of the nine children went to America and one, Robert fought in the Civil War. 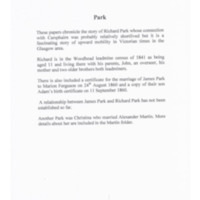 These papers chronicle the story of Richard Park whose connection with Carsphairn was probably relatively shortlived but it is a fascinating story of upward mobility in Victorian times in the Glasgow area. 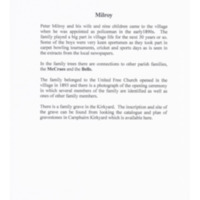 Peter Milroy and his wife and nine children came to the village when he was appointed as policeman in the early1890s. The family played a big part in village life for the next 30 years or so. 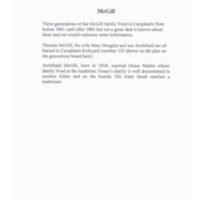 Three generations of the McGill family lived in Carsphairn from before 1841 until after 1881 but not a great deal is known about them and we would welcome more information. 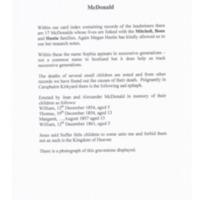 Within our card index containing records of the leadminers there are 17 McDonalds whose lives are linked with the Mitchell, Bone and Hastie families. 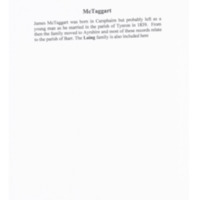 Again Megan Hastie has kindly allowed us to use her research notes. 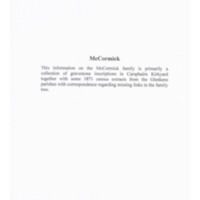 This information on the McCormick family is primarily a collection of gravestone inscriptions in Carsphairn Kirkyard together with some 1871 census extracts from the Glenkens parishes with correspondence regarding missing links in the family tree. 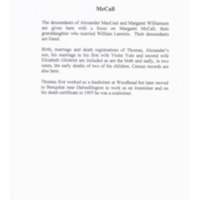 The descendants of Alexander MacCaul and Margaret Williamson are given here with a focus on Margaret McCall, their granddaughter who married William Lammie. Their descendants are listed. This family who lived at the Mine spread themselves far and wide. 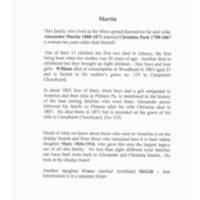 Alexander Martin 1808-1871 married Christina Park 1798-1867 a woman ten years older than himself. 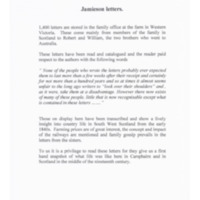 1,400 letters are stored in the family ofﬁce at the farm in Western Victoria. These come mainly from members of the family in Scotland to Robert and William, the two brothers who went to Australia. wife Isabella McCartney are included. 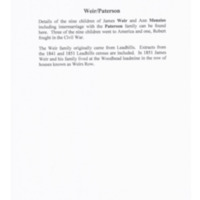 This rich collection of material about this family comes mainly from Australian sources which is hardly surprising given that eight of the nine children who reached maturity went to either Australia or New Zealand. 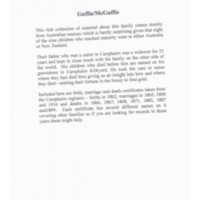 The Good family were in Carsphairn as far back as 1714. Adam Good (1813) and William Gilchrist and Margaret Good. 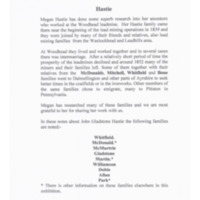 thanks to Megan Hastie for her research.